It's back to school shopping for most of us this month. My youngest daughter attends a special needs school because she has a rare neuro-genetic disorder called Angelman Syndrome. Her school doesn't require parents to purchase or send in any supplies. The only thing I have to buy for her is a book bag to hold her diapers, extra outfit, school communication folder (that the school supplies), smock for eating and swim clothes if it happens to be swim day. I choose to also purchase a lunch box rather than pay for my daughter to eat meals at school. I do this for several reasons, one of which being that her schedule doesn't match up with everyone else's. She often refuses breakfast, which makes her hungry again a little while after lunch. I end up sending in a breakfast and two lunches. All this food doesn't fit in standard lunch boxes. That is why I was so excited to discover EasyLunchBoxes. 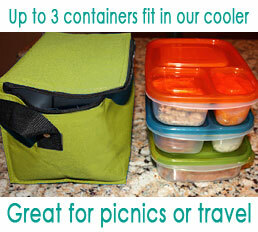 EasyLunchBoxes sells sets of four containers that have three compartments in each container for $13.95. Next, they have a cooler (lunchbox) for $7.95 that fits three of the containers. That is exactly what I needed because I send in three meals. Now all of the food can fit in one lunchbox. Since I save so much not having to purchase school supplies for my daughter, it was well worth it for me to splurge on buying these, although the prices are very affordable anyway. If you are the type of parent that likes to send food in with your child to school, consider getting these products from EasyLunchBoxes. I don't profit in any way from telling you about this, I just found them to be a Godsend!